Consulate General of the Republic of Serbia wishes to remind the citizens residing in the United States that when applying for a passport it is no longer necessary to enclose the birth certificate and the certificate of citizenship of the Republic of Serbia. This regulation entered into force in June 2016 and is being applied since then. Data from the registers will be obtained through official channels. When applying for a passport applicant is required to sign a statement that he/she agrees that the necessary data are obtained in this way. The legal deadline for the exchange of data from official records is fifteen days. Details about the request for passport application can be found here. Regardless of the above, the applicant, if he/she so wishes, may submit the birth certificate and the certificate of citizenship of the Republic of Serbia, not older than one year. In this case, the processing of the request for a passport will be shorter by the time period needed to acquire the data through official channels. To the Serbian nationals who apply for a passport and at that time declare that the data from the registers be obtained through official channels, Consulate General recommends that they bring with them the old documents if they have them. Data from these documents will be used to fill the application in more detail. 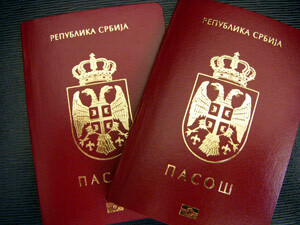 Consulate General notes that Serbian citizens who plan to travel to Serbia during the summer months and want to apply for a new passport at their place of residence there may do so through the same fast-track procedure. In order to do so it is necessary to present proof of residence abroad which in this case is USA (Green Card or valid US visa).